In the previous section (section 5) it was noted that the process of BNF takes place after a legume root has been infected by soil bacteria of the genus Rhizobium. It was also noted that these bacteria are capable of living naturally in the soil, without legumes present. When forage legumes are grown in these soils, the rhizobia already present infect the roots of the plants and form nodules. Thus, in some cases the infection and nodulation of forage legumes may take place naturally, that is without human intervention. In commercial forage production, human intervention may be necessary to ensure adequate levels of infection and nodulation. There are at least two reasons why this may be the case: 1) Non optimal soil conditions, and 2) Absence of the specific Rhizobium species or biovar needed for the forage crop in question. Non optimal soil conditions would include acidic soils, soils that are too hot, or waterlogged soils. Absence of the specific Rhizobium species or biovar needed for maximum infection and nodulation may occur if the forage crop being grown has not been grown in the soil for a number of years. This specificity of certain rhizobia for certain forage legumes is noted in section 5 and further explained in the following discussion. The bacteria that is most often used to inoculate forage crops is bacteria in the genus Rhizobium. Furthermore, it has been determined that different forage legumes require different species or even different biovars within species of Rhizobium for successful formation of nodules. For example, a Rhizobium species or biovar that will successfully nodulate alfalfa may not effectively inoculate some clovers. The term 'effectively inoculate' is used by some authors to indicate that the processes of infection and nodulation have occurred successfully and that BNF will take place in these nodules. To indicate which species or biovars of rhizobia effectively nodulate which legumes, scientists have developed so called 'cross inoculation groups.' 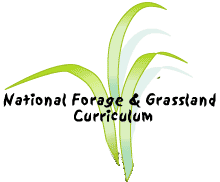 The term 'Cross inoculation groups' refers to a classification scheme used to designate which groups of forage legumes are successfully inoculated by which species or biovars of rhizobia. For example, the cross inoculation group for the species of rhizobia known as Rhizobium meliloti is alfalfa (Medicago sativa) and sweetclover (Melilotus spp.). The table below summarizes some of the cross inoculation groups for some important forage crops. If the bacteria in the soil are not providing optimal, effective infection and nodulation (i.e. inoculation) in the forage legume being grown, human intervention in the form of inoculation is recommended. Inoculation may be defined as the process of adding effective bacteria to the host plant seed before planting. The purpose of inoculation is to make sure that there is enough of the correct type of bacteria present in the soil so that a successful legume-bacterial symbiosis is established. There are several ways to inoculate forage legumes with the proper type of bacteria. Probably the most convenient way to inoculate seed is to let someone else do it for you. A number of seed companies offer forage seed that is pre-inoculated. Pre-inoculated seed is usually seed that has been coated with variable mixtures of the appropriate bacteria, peat, minerals, limestone, and some type of sticker to hold the mixture together on the seed. As with almost any other management decision, a decision to use pre-inoculated seed should take into account the main advantages and disadvantages of this approach. As previously noted, the main advantage to this approach is convenience. The main disadvantage will usually be cost, since pre-treated seed will cost more than untreated seed. Nevertheless, some forage producers believe that purchasing pre-inoculated seed is like buying insurance to virtually guarantee successful nodulation of the crop. A second way to inoculate forage legumes is for the grower to inoculate the seed just prior to planting time. The procedure and ingredients are similar to what a commercial manufacturer of pre-inoculated seed would use. It is necessary to purchase the appropriate (correct cross inoculation group) inoculant from a reputable supplier. The inoculant should be clearly labeled as to which crops it is to be used on (cross inoculation group). In addition, the inoculant should be labeled with an expiration date. Over time the bacterial population in a commercial inoculant will decline and be less effective, so growers are advised not to use inoculant past its expiration date. Most commercial inoculants consist of rhizobia bacteria mixed with peat. The peat based inoculant may be simply mixed dry with the seed, although this technique is not strongly recommended because the inoculum may not effectively coat much of the seed. A more highly recommended approach is to use a sticker such as sugar water solution or some commercial sticking agent. The sticker helps ensure that the majority of the seed is well coated with rhizobia. Whatever technique is used to inoculate seed, inoculation is generally recommended when establishing a new stand of forage legumes. If the same crop has been grown recently in the field and it has been determined that it was effectively nodulated, then inoculation may not be necessary. In general, the relatively small investment of time and money in inoculation pays valuable dividends to both the grower and the farm environment.